As I’m writing this, I just happened to glance outside and saw a hummingbird in the backyard! Hummingbirds make me so happy! It tells me, one, it’s Springtime and two, I have enough flowers blooming that they want to stop by for a quick sip! This week I want to share a few recipes that really celebrate the fresh flavors of Spring. Easter is this weekend, and what I love about that holiday is that it’s the perfect opportunity to showcase bright, spring vegetables! Even though I buy asparagus throughout the year, this is the time when they taste the best and don’t break the bank! The recipe is so easy and I think it will be perfect on the Easter table. The asparagus is roasted in the oven and then finished with a sauce that is both bright and fresh as well as richly decadent. This is yet another one of those sauces that I have to keep myself from eating with a spoon! Rinse the asparagus and trim off the tough, woody ends. The easiest way to do this is to hold the asparagus stalk between the thumb and forefingers of both hands. Bend the stalk. The place where the stalk naturally breaks is the place where it’s tender. 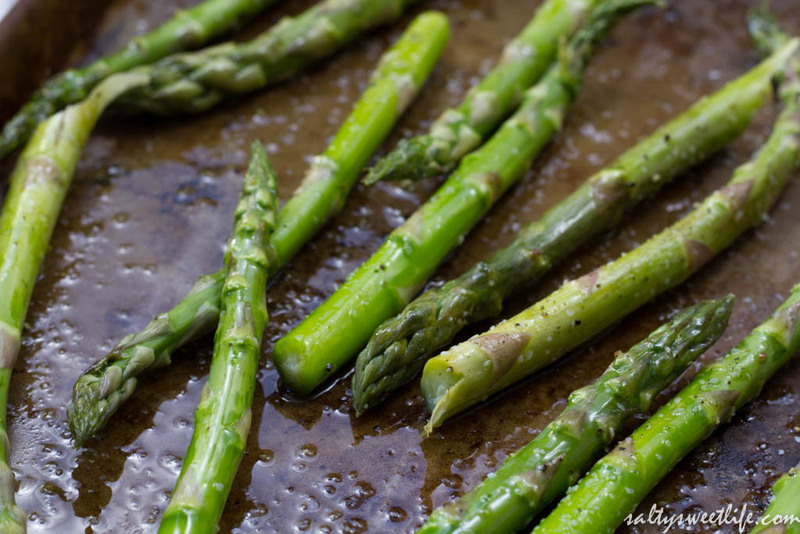 Spread the asparagus on a shallow baking pan and drizzle with olive oil. Season with salt and pepper. Roast in the oven for 20-25 minutes until the asparagus is tender, but not overcooked. 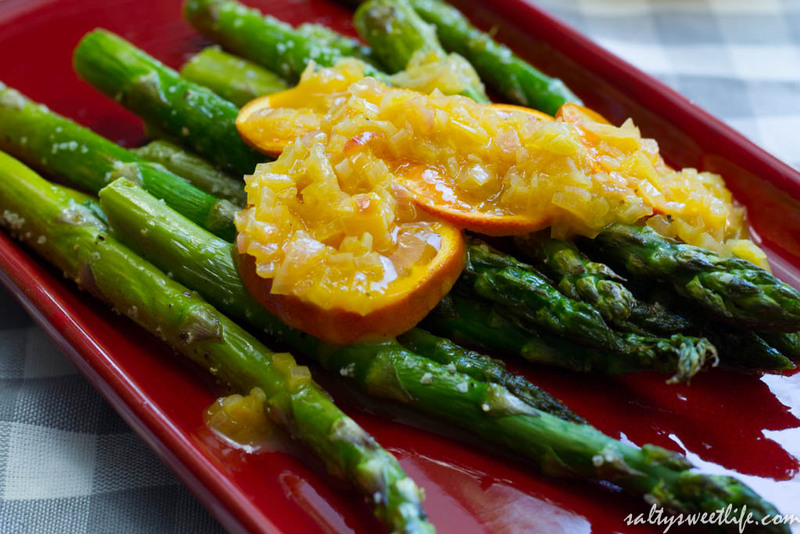 While the asparagus is roasting, combine the clementine juice with the shallots in a small saucepan. Over medium heat, cook the mixture until the juice is reduced to approximately one tablespoon. Remove the pan from the heat. Quickly whisk in the cold butter until the mixture is creamy and well-mixed. Season with a small pinch of salt and pepper. Remove the asparagus from the oven and place on a serving dish. 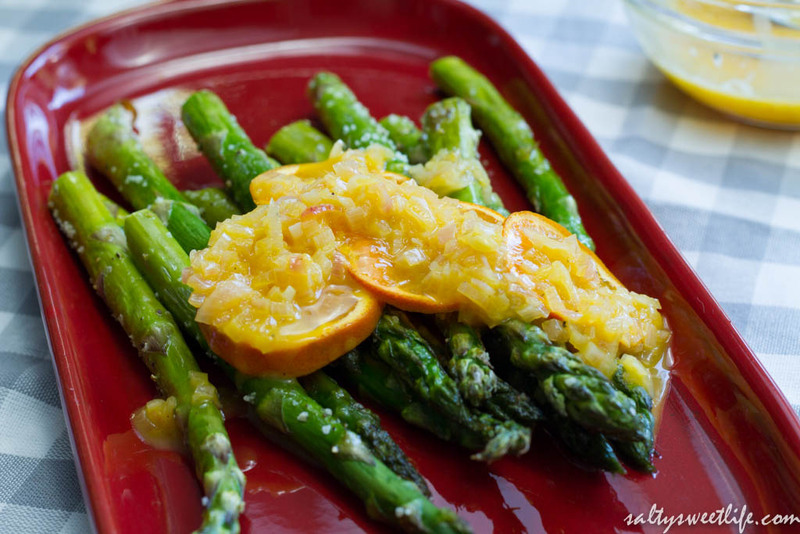 Spoon the sauce over the asparagus and serve immediately. What a wonderful spring dish, perfect for Easter Brunch. Thank you Libby! I’ll bet you’re cooking up something amazing for Easter! Hi Ronda! Thank YOU so much! I really appreciate it! Glad you liked the recipe!